What is procrastination and how can we minimize procrastination for ourselves and our team members? We all procrastinate; it’s one of the primary causes of poor time management. Procrastination is the intentional avoidance of doing something you should be doing that is also important. For me procrastination has to involve an important task. If the task is not important and you don’t do it (or you delegate it), you may in fact be practicing good time management. Activities like sleeping and daydreaming are not procrastination… unless you do them to avoid doing something important. The following are five common reasons why you may procrastinate (note: procrastination may encompass more than one of the following). Your boss asks you to consider hiring their friends’ child between university semesters. They meet the job criteria so you hire them. Unfortunately they consistently arrive late and are indifferent to detail. You provide repeated feedback but your efforts fail to improve their performance. Fear that if your boss is unhappy (or if this negatively impacts his personal friendship), that this will impact your career. Have never had to fire someone and you don’t know how. When you procrastinate on important stuff you deprive yourself of the success, the experience and the pride from a job well done. So what should you do? 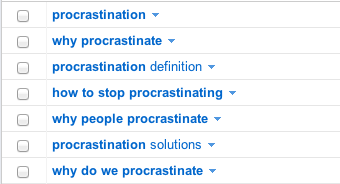 The following are a few procrastination solutions. List all the things that are important to you / your job then list all the things that you are busy with that are not important to you / your job. Refocus your activities on the things that are important and plan how to get them done. This is a powerful time management technique. If it’s important – start it now. Planning may be your best solution. List all the critical milestones that may be required (you may not list them all immediately… but it will be a start). Next, break those milestones down even further. Include timelines – even really high-level start / end dates. By beginning to explore the steps you can start to see where you can begin the project large tasks start to appear more manageable. Don’t focus on what you can’t do – focus on what you can do. Don’t let a concern of being perfect stop you… especially during the scoping / planning phase. Consider the 80/20 rule; you may be able to delegate the 20% that you will want to procrastinate on to someone who is interested in that work. List all of the pros vs. cons of starting the project… especially if there may be serious +ve or -ve repercussions. By listing all the pros you can help sell the benefit of your actions. By listing all the cons you can try to minimize them or at least be prepared for them. Hold a brainstorming session with your team. Ask for volunteers to work on certain milestones… or delegate. Now you can act as manager and mentor and learn with your staff. Call on your mentor – ask them for guidance. Use the Internet. There is a lot of great support in blog posts and articles. If you find an article you like try to connect via email or LinkedIn with the author. If you are in the same city the author might be able to meet with you. Networking has changed so change with it. Knowing your personal procrastination weaknesses helps you manage them and not let them run you. Try a few of the ‘How To Stop Procrastination’ suggestions and you will learn how to stop procrastinating. You’ll also see important components of the project you can (and should), delegate to others. Your pride and confidence will increase, as you stop procrastinating and feel better about your work and yourself.